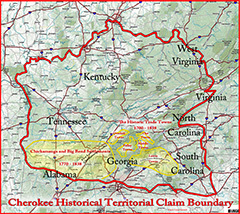 This famous battle took place in Ballground, Cherokee County, Georgia. Accounts differ on exact events, however, the Creek, who greatly outnumber the Cherokee, attack the Cherokee line five times. During the fifth attack elderly Cherokee leader Kingfisher is slain. His teenage wife picks up his weapon, and chanting a Cherokee war song, Nancy Ward leads the Cherokee to victory, routing the Creek. The battle marked successful expulsion of the Creek from much of North Georgia. The only major remaining Creek settlement was near present Rome, Georgia.